With prices under $25,000 (some way under) these cars make excellent choices for those shopping for their first new set of wheels. 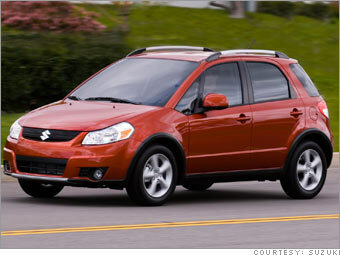 Suzuki bills the SX4 as a small SUV. It's not. Aside from having AWD, the SX4 is a good, but not really remarkable, little car. It's roomy and comfortable inside with a well-constructed cabin. But you can find other small cars that manage that. If you need something that will get you around in the snow, though, the SX4 is your little car. It even has an "AWD lock" setting for those times when there's really no pavement to grab.